The above passage is the essence of what Octavia Butler wanted to communicate with her Earthseed duology — of which Parable of the Talents is the concluding volume — I think. 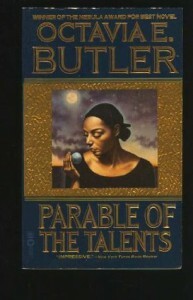 The previous book Parable of the Sower sets the dystopian — almost post-apocalyptic — scene for the two books; it depicts the decline of civilization and the heroine Lauren Oya Olamina’s struggle to survive and find a safe place to settle down and build a community that will help revive human civilization and also move it forward. At the end of [b: Parable of the Sower|52397|Parable of the Sower (Earthseed, #1)|Octavia E. Butler|https://d.gr-assets.com/books/1442169447s/52397.jpg|59258] Lauren has founded a community called Acorn, which she intends to form the foundation of her “Earthseed” project with an ultimate goal of space colonization for mankind. Parable of the Talents continues directly with this state of affairs. The year is now 2032 and the Acorn community continues to grow with new hungry and homeless travelers drifting in, and the community has begun trading with nearby communities. The Earthseed project is beginning to take root with Lauren’s leadership and business acumen when it is suddenly invaded by government sponsored religious fanatics called “The Crusaders”, a tacitly approved faction of “The Church of Christian America” ruling the US. This happens around the middle of the book and begins the second phase of the storyline where the Acorn residents are captured, enslaved, and tortured by the Crusaders zealots. This section of the book is a harrowing read due to the vivid depiction of the Acorn people being violently abused by the Crusaders, they are forced to wear which can cause tremendous pain at the touch of a button on a remote control. All the women — including Lauren — are raped by their captors. How Lauren and her friends end their imprisonment will have readers cheering. Then we move on to the final section of the book which I won't elaborate on at all. Suffice it to say that the book ends very well and should leave most readers fully satisfied. I really want to rate parable of talents 5 stars because it is an excellent novel and a well deserved the Nebula Award winner, but I can't do that in good conscience as I do have one minor issue with it. Lauren’s Earthseed religion is fine as an idea, it differs from most religions in that it has no supernatural elements in its teaching, a sort of atheistic religion if that is not an oxymoron. Still it does require a lot of faith from its followers with its long-term goal of interstellar emigration. The issue I have with this book is with the frequent litany of “God is Change” and several less than convincing passages from Lauren’s “Earthseed: The Books Of The Living” which is basically their bible. My issue probably has more to do with my aversion to litanies than any misstep on Butler's part. Her prose is as powerful as ever. “It was all I could do not to fold up among the rows of plants and just lie there and moan and cry. But I stayed upright”. Curiously I tend to picture Lauren Oya Olamina as looking rather like Octavia Butler herself — based on the author's photos — with her strong features, intelligent and kind face. 4.5 stars rating then, half a star knocked off for the litany. I still rounded it up to 5 graphical stars though because Octavia Butler is my sci-fi queen! 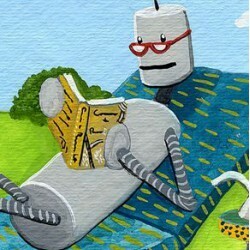 In this interview with Amazon Ms. Butler talks about the two Earthseed books and her other works. YA Dystopian fiction is — for some reasons — all the rage these days, but for me a great dystopian novel should be about more than good looking teens hacking and slashing. In all fairness [b: The Hunger Games|2767052|The Hunger Games (The Hunger Games, #1)|Suzanne Collins|https://d.gr-assets.com/books/1447303603s/2767052.jpg|2792775] probably has more depth than what I have gleaned from the first book (I haven't read the others) but this is all that have taken from it. The nuances — if they are there — did not reverberate with me. As for the numerous Hunger Games knock-offs I have no time for them. The two Earthseed books are much more substantial, the adventures, slicing and dicing are there, but there is so much more to it, and it even rings true.